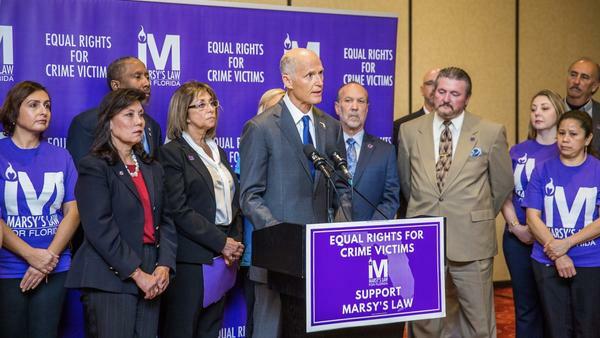 Governor Rick Scott speaks on behalf of Marsy's Law in Florida at an event in March..
Amendment 6, also known as Marsy’s Law passed Tuesday. Click here for the results. The right to accurate and timely notice of all of the case’s public proceedings, including pleas, trials and sentencings. The right, within the judicial process, to be reasonably protected from the accused and any person acting on behalf of the accused. The right to confer with the prosecuting attorney concerning any plea agreements, participation in pretrial diversion programs, release, restitution, sentencing, or any other disposition of the case. The right to be informed of all postconviction processes and procedures, to participate in such processes and procedures. The right to due process and to be treated with fairness and respect for the victim’s dignity. The amendment’s opponents, including the American Civil Liberties Union and many criminal defense attorneys, argued a lot of the rights are unnecessary because most are already in state statute. But proponents, including several sheriffs and prosecutors, said they’re not being enforced, and a constitutional amendment would give victims more legal heft to sue. Opponents also said the additional rights could infringe on the rights of the defendants. One vocal opponent, Gainesville-area State Attorney Bill Cervone, said some of the rights would be impossible to enforce, like new appeals deadlines. “[It] sets up expectations that anybody who functions in the system now knows cannot be met, and I think it to be fundamentally wrong to mislead victims or the public into to thinking that all of a sudden they’re going to have them,” Cervone said, pointing to case backlogs in understaffed courts. But proponents say Marsy’s Law ensures victims are treated with consideration and dignity. Marsy’s Law is named after a California victim, stalked and killed by her ex-boyfriend. Just a week after Marsy was murdered, her mother was confronted by Marcy’s accused killer in the grocery store. She didn’t know he had been released on bail. This prompted victims’ rights to be added to California’s constitution. Several other states have followed, as this election, states like Georgia and Kentucky also had Marsy’s Law on ballots. 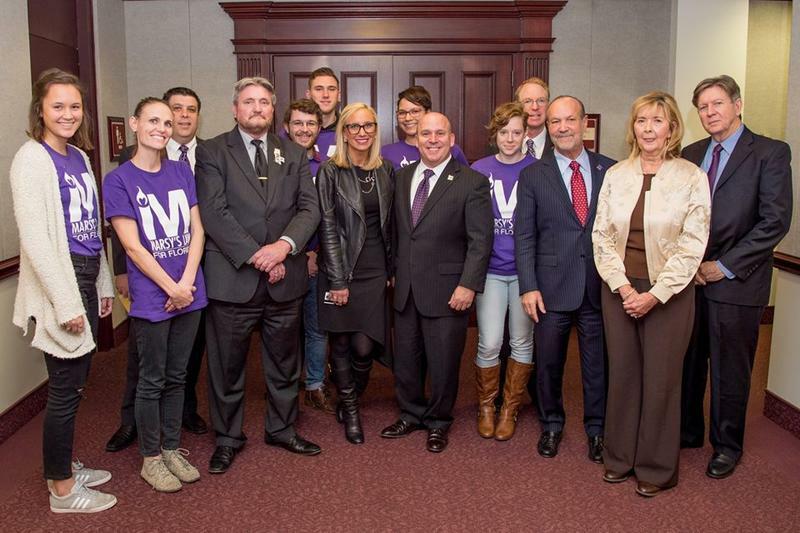 Marsy’s Law advocates are pushing for the constitutional rights in all states. But Amendment 6 addresses more than just victims’ rights. Its passage ups the mandatory retirement age for judges from 70 to 75 and requires judges to interpret laws themselves rather than rely on state agencies’ interpretations of them. Reporter Lindsey Kilbride can be reached at lkilbride@wjct.org, 904-358-6359 or on Twitter at @lindskilbride. With wide variations throughout the state, 62.1 percent of Florida voters cast ballots in Tuesday’s mid-term elections, according to numbers posted on the state Division of Elections website. The highest turnout, nearly 77.7 percent, came in Sumter County, which includes a large part of the massive Villages retirement community. Other counties with the highest turnout rates included Jefferson County at 75.6 percent; Collier County at nearly 73.5 percent; Franklin County at 70.8 percent; and St. Johns County at 70.3 percent. Voters will decide whether to place victims’ rights in the Florida Constitution this November. Advocates say it’s necessary to give victims a voice in the criminal justice process. But opponents argue these rights already exist under Florida law.